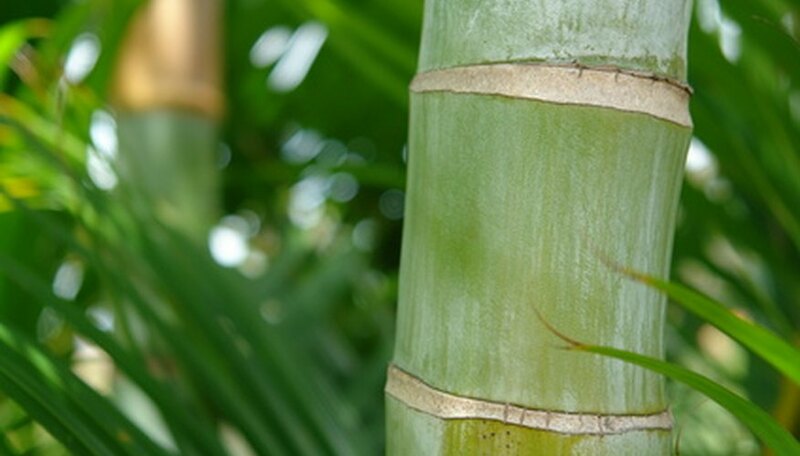 A clustering palm with slender trunks that are 2 to 3 inches in diameter, the areca palm (Dypsis lutescens) is also commonly called butterfly palm, golden cane palm or bamboo palm. A mature areca palm clump boasts trunks as tall as 25 feet, with overall plant dimensions 35 feet tall and 25 feet wide, according to "An Encyclopedia of Cultivated Palms." It makes a fast-growing hedge or screen for tropical landscapes in U.S. Department of Agriculture hardiness zones 10 and warmer, although a singular specimen makes a graceful focal point. While a healthy, lushly growing areca palm makes an effective visual screen and evokes romantic images of the unexplored jungle, occasional trimming/light pruning helps it look its best in the garden landscape. Robert Lee Riffle comments in "An Encyclopedia of Cultivated Palms" that areca palms look more beautiful with a silhouette that exposes the many trunks. Pruning of an areca palm centers on occasional removal of trunks and suckering sprouts/stems from the base of the clump, according to the Learn2Grow plant database. Hand pruners, loppers or a pruning saw facilitate the removal of excessive foliage or clutter. Make pruning cuts as close to ground level as possible, or to the dense root and stem mass at the plant base. Also remove any fronds that are posing a hazard, such as low-hanging ones that block a walkway or infringe on a building facade or utility wire. Pull out any dead brown fronds that drop and congregate in the leafy thicket at the areca palm base. The areca palm can be trimmed anytime of the year in tropical landscapes, but early to mid-spring is best since it is just prior to the natural emerging growth of fronds in the warm months of spring and summer. Abundant regrowth over summer may warrant a secondary trimming in fall to clean up the look of the areca palm and remove any hazardous fronds before growth drastically slows across the cooler winter months. Any frost damage sustained in winter should be pruned away in spring when there is no risk of further cold weather snaps. Areca palms grow and look their best in moist, fertile soils that are not alkaline in pH. Stressed plants from drought or alkaline soils often grow more slowly, with fewer sprouting trunks, and with unsightly yellowed fronds. Lack of iron, magnesium and nitrogen in sandy soils often causes the normally green leaflets to be yellow; only the frond stems (petioles) are naturally yellow. Riffle also comments that removal of healthy green palm fronds reduces the areca palm's ability to produce its own food. Therefore, refrain from arbitrary trimming of palms, especially in nutrient-poor or dry soils that delay regrowth of new, healthy replacement leaves. The areca palm grows in height from the top growing point on each trunk, known as the crownshaft. Damaging or removing the crownshaft effectively kills that trunk as it will not regrow a new one. You cannot limit the height of a growing areca palm by tip pruning, as ultimately you remove all growing tips from all trunks. If you remove a trunk, cut it all the way at the base of the plant clump and allow a young suckering sprout to grow to replace it. Rejuvenate an areca palm by cutting off a majority of tall trunks and letting the clump sprouts regrow for several years into new trunks.